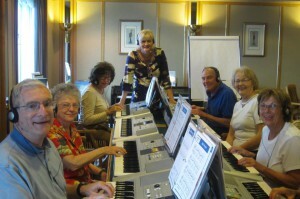 This class is geared for the beginner adult who has always wanted to play the piano. 2) They are afraid of the expense of piano lessons because they are concerned they do not have time to practice. Both of these obstacles are solved with Ursula’s fun and relaxed way to learn the piano. Students will practice and learn during the one hour lessons. Students will be playing tunes they enjoy in the first lesson. Enjoy learning in this relaxed and joyful atmosphere!